The subject of brand has come up lately in several contexts, giving us the impetus to focus and get in-depth with the subject in writing. There are many ways to look at a brand because there are so many elements of it that can make or break how people view your company. It isn’t a coincidence that it’s a hot topic. The economy seems to be moving in the right direction, consumer confidence is up and companies are more concerned with their brand images to position themselves to take advantage of opportunities when they come – much like making sure you look your best before a big date. For agencies, corporations, smaller companies or professional firms – it’s more and more important for a company to know who they are as a brand, because potential customers will sniff out a brand personality that doesn’t fit. Gone are the days when companies could define their brands without input from the outside. Whether you are in a corporation trying to improve brand recognition, on the agency side wanting to differentiate from the pack or a professional firm working to modernize and update your name and image, it’s important to find out from the outside marketplace as well as internally what the impressions are and work from there to define your brand. What’s the value of a brand? How do you define it and what do you do to improve your brand? Read our white paper and find out more. And, please let us know if there is other content you’re interested in knowing more about. Several new companies have been added to the client roster recently at d.trio. The new business spans verticals including financial services, higher education and professional services. The new work is spread across several marketing channels. We’re currently doing B2C direct mail and email for a multinational insurance company, a direct mail movers program and graphic design for a large regional bank, video for a local capital management firm, print collateral materials for the liberal arts college of a major state university, a three-dimensional lead generation program for a leading, integrated financial services company and a full rebranding and website overhaul for a law firm. It’s exciting to have the opportunity to work on projects that offer such a variety of challenges, strategy and tactics. And we’re looking forward to more of the same over the coming months. A fresh perspective on an existing website. In 2014, d.trio was instrumental in helping The Informatics Group revitalize their brand. We partnered with our client to re-establish the brand’s meaning and reposition The Informatics Group as a leader in highly specialized IT consulting. 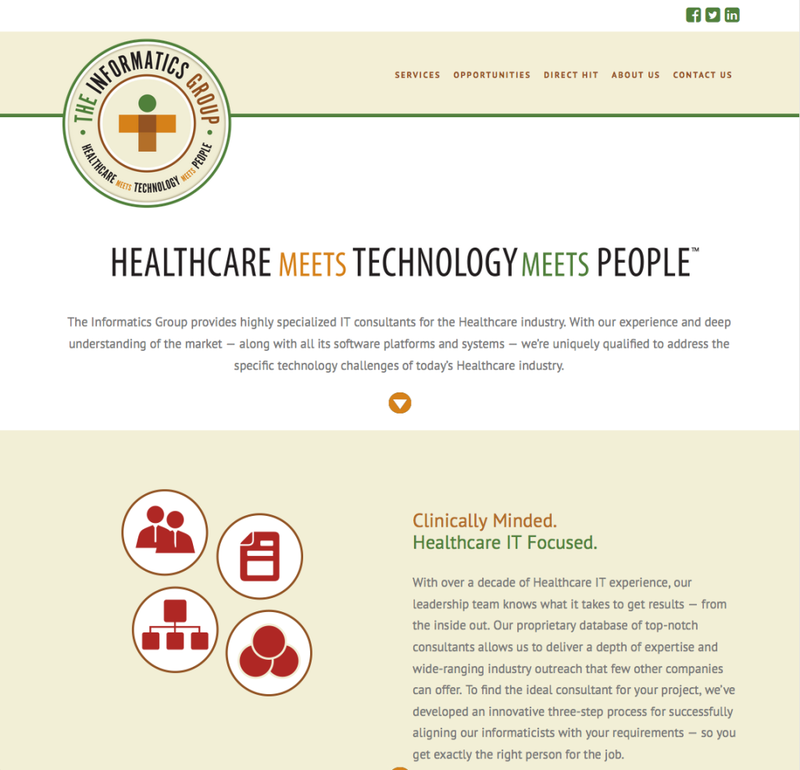 A natural next step for The Informatics Group was a refresh to their current website. d.trio executed a new site, reflecting the brand’s unique position in the market place, creating a modern and sophisticated look and feel while reflecting the playful edge of the stakeholders. The new site launched last week and reception has been overwhelmingly positive! In a creative rut? Try these tips. When you’ve got a creative problem to solve quickly, it’s easy to fall back on old habits—and recycle those tried and true solutions that have worked again and again. But when it comes to creativity, originality is the key. So how do you keep your ideas fresh—especially when you’re faced with a tight deadline? Dig deeper. Don’t settle for the first solution—or the tenth (it’ll either be obvious, cliché, or something you’ve used before). To get a great idea, you need a lot of ideas. Keep going until you run out of time. Make inspiration a way of life. This is more of an ongoing lifestyle tip. But it’s essential. If you want to be able to call on your creativity when under the gun, you need to fill the well all the time. Inspiration feeds creativity. If you’re always seeking out new things and ideas, you’ll have more to draw on when you need it. Seek inspiration in unusual places. If you’re looking for say, an idea for an ad, don’t look to other ads for ideas. Change the context and you’ll be forced to approach the problem in a new way. Use idea-generating techniques. This is a whole post in itself, but suffice it to say there’s a ton of information out there on this. The more techniques at your disposal, the better. Don’t approach every problem as you always have. Mix it up and you’ll challenge your brain to stretch in new ways. Have fun. When we’re feeling pressured, our creativity suffers. Great ideas come from a relaxed mind. So try not to put so much pressure on yourself. Listen to music. Move around. Having fun will free you up to take more risks and help you to step outside your familiar patterns. Generate, don’t evaluate. Don’t edit yourself. Focus on quantity, not quality. Allow yourself to come up with ridiculous ideas. Run with any and all possibilities. Judging your work will only tense you up and make it harder to access the good stuff underneath. Phone a friend. Talking about the problem with somebody else will send your thinking in new directions and help shake things up. Think about something else. Sometimes, it’s only when you step away from the problem that the answer appears. So take breaks. Focus on something else. Go for a walk. Put your subconscious mind to work. Have faith. It’s amazing how much better you think when you believe that you’ll come up with something great, instead of worrying that you won’t. Trust that something brilliant will come, and you’ve got a much better chance of doing it. So how do you keep your ideas fresh? Got a technique you’d like to share? We’d love to hear it! Send us an email and let us know what works for you. What’s in a name? Why some professional services firms are opting for shortened names. Recently, we at d.trio had the pleasure of working with a new client, a law firm interested in rebranding and repositioning itself in a more modern market place. Although a name change was not part of the original re-branding assignment, it was brought up as somewhat of a sidebar in early deliverable discussions and was deemed worthy to address in our Branding Discovery process. Through our discovery process and preliminary research we noted that shortened names are a definite trend within the law firm community, fueled by firms’ desire for a more sleek, modern, recallable and online-searchable brand. There has been a fair amount of writing on the subject in the marketing press, a great majority of which in favor of more compact brand names. So why are shortened names beneficial? Historically speaking, consumers prefer shortened brand names to lengthier ones and tend to trim long brand names into shortened ones on their own. In marketing this is called the Nia Effect, also known as the Consumer Behavior Effect. From a marketing perspective, professional brand and naming experts believe brand names acquire meaning, they do not create meaning. Your brand is what consumers tell each other it is, advocating for shortened street names. Most notably in the Twin Cities, Dorsey and Whitney opted for their street name of Dorsey, and Maslon Edelman Borman & Brand shortened their name to Maslon. Shorter law firm names are easier to remember and repeat benefitting current clients and potential clients. It keeps your firm top of mind when seeking repeat counsel or referral business. Shorter firm names support name recognition and corporate branding standards. Shortened names create less confusion from an overall branding perspective; it is conducive to more effective branding strategy and creates more consistency for you corporate identity. Shorter law firm names work best with emerging technologies. In today’s market, web site addresses need to be easy to remember, type and to find for the consumer. Companies with shortened names are also much easier to accurately index with major search engines like Google, Bing and Yahoo! From an SEO (search engine optimization) and SEM (search engine marketing) standpoint, the shorter the name, the easier it is for search engines to index your site resulting in higher ranking and easier search-ability. Timing – A firm does not undergo re-brandings on a regular basis so if you’re already considering a re-brand, now is your best opportunity to act on a change. Within the context of a new, refined look overall, the shortening of the name can more easily be viewed as a natural evolution. Risk/reward. Try to objectively evaluate the real risks and rewards of a shortened name. There are several meaningful rewards to leverage from a branding perspective – are there substantial marketplace risks (or internal complications) to balance against the positives? Condensing partner names certainly seems to be the trend within law firms and other professional services branding right now. We at d.trio believe there’s no absolute right or wrong answer on whether a firm should shorten its name, it all comes down to what’s right for your brand, the culture and your market. For our client, it seemed like a natural evolution and we look forward to helping them in their transition! As I reflect on the 15 years d.trio has been in existence, I think about all of the changes marketing (and the world) has gone through. It seems we do everything differently – it’s all electronic now. 15 years ago I had just gotten my first cell phone. We started our business with a fax machine, an iMac (the teal one with the bulbous shape) and a landline phone. When d.trio got rolling, we spent thousands a month on courier services sending mock-ups and other information back and forth. We had phone conversations, face-to-face meetings and lunch with clients (and happy hour). We’ve been through a recession caused by terrorism and a great recession caused by greed and hubris. It’s been a wild ride. So what hasn’t changed in all of this? The human element. Marketing and sales – they are about finding human connections. Humans are craving authenticity and transparency. The things you had to give people in the old days when you sat across from them or talked on the phone, because you couldn’t hide your BS behind electronic communications and finesse your message. Maybe there’s a lesson in this for us. Maybe the best way to be real is just that. Be real. On my first day I met the entire d.trio group, had my first team meeting, and of course – out to lunch with everyone. A great way to start! Melissa is director of business development at d.trio. I started freelancing with d.trio 14 years ago, after working with the 3 d’s at a previous Design Firm. I was excited to work with them all again! Spent my first day at d.trio partly under a desk in Megan’s house, plugging and unplugging the fax and phone lines on a shared outlet.